I happened to google Soma juice and this thread popped up.... I hope I can help. I have owned a juice for 4 years now. I raced the SSWC on it and I have ridden tons of fun single track on it and I have recently converted it into a rigid commuter. I have used 135QR and 142x12 rear axle on it and it is a 19" frame. This is hands down the most flexy steel frame I have ever owned. It is not close. With wide bars, you can watch the front triangle twist when cranking up hills. That said - when using it for cruising around, it is one of the best riding frames I have owned. Super chill and smooth. With a 100mm fork on it, had decent manners, but a 120mm made the front feel detached from the bike. The confidence factor plummeted quickly. Now with a rigid, it wa great around the neighborhood, but one you put any weight on the racks, it is a wet noodle again. I see the OP concluded it is just a flexy frame and he is right. Just wanted to confirm. I am comparing the ride to my other steel frames - my Vassago, Stanton and Salsa are significantly more confidence inspiring. frame. I have the 21" size. Although, I enjoy this bike for the most part, I probably would not buy another one. I very much doubt that you can twist the frame in any direction by merely torqueing the handlebars. Perhaps it's bars or stem. You've never grabbed the bars, held the brakes and shifted back and forth? Or done the same while riding without hitting the brakes? I can always feel the frame flex that way. My steel frames flex, my CF does much less, my aluminum barely at all, and my wife's old C'dale was so stiff as to feel completely dead the few times I tried it. In any case, that frame looks like it would be flexy. i am amused by this. Assuming you have little to no experience with the some in a size 19 or 21? You can watch the frame twist on this bike with minimal effort. Set it up 2x10 and sprint... the chain will contact the front derailleur repeatedly, and not just a little. Bars flex, but in no way is it even remotely what this bike does. I have been riding mtbs for the past30 years. This bike stands out as a noodle. Ride lighter , don't Mash .. spin, seated..
Do what Schwinn used to do: fill the steel tubes with concrete. You are arguing against a stance I have not taken, and misinterpreting what I originally said. The statement I quoted implied bubba could flex the frame, even when not pedaling, by twisting the handlebars. All I said was that I doubted that was possible, and that any deviation was more likely limited to the bars/stem. I don't know why you are so bent toward negating my opinion, but as I have no dog in this hunt I'm outta here. So I went looking for pics of the Juice and found the pic below. 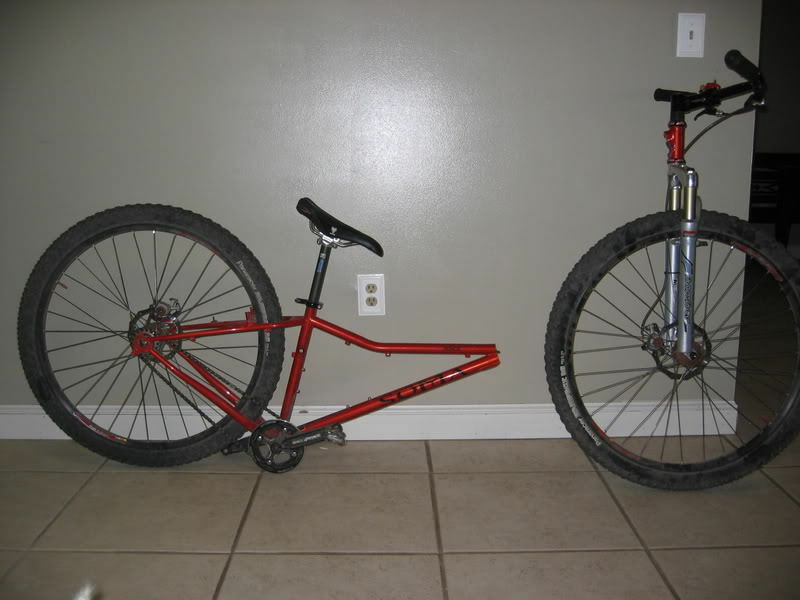 The pic (rider claimed he jumped a log, landed flat, and the frame split, with an arm laceration needing 6 stiches) and and your "flexiest frame I have ever ridden" would put this model into the "bikes to avoid" category. The frame diamond is very narrow, and the top and down tubes are way too close together (heat tube too short, the triumph of form over function? ), which puts high stress on the joints. This allows normal bike stresses to cause very high strain (flex). If the stress is high enough, it doesn't take many small jumps to induce a fatigue failure. If my theory is correct, the design could be flawed which may be why you are getting excessive flex. Last edited by WizardOfBoz; 03-18-19 at 12:10 PM. The advert I saw said the frame was CroMo. The failure below shows rust around the bottom of the downtube weld, I think. Thus, probably a fatigue failure due to exceptionally high stress at that point. As the crack developed, water got in and rust formed. Then a normal mountain bike procedure (hopping a log) caused the weakened joint to give. My take anyway. Last edited by WizardOfBoz; 03-18-19 at 12:12 PM. Interesting. BigBubba76's frame is a bigger size, and looks like a different design completely than the broken frame. Different model years? 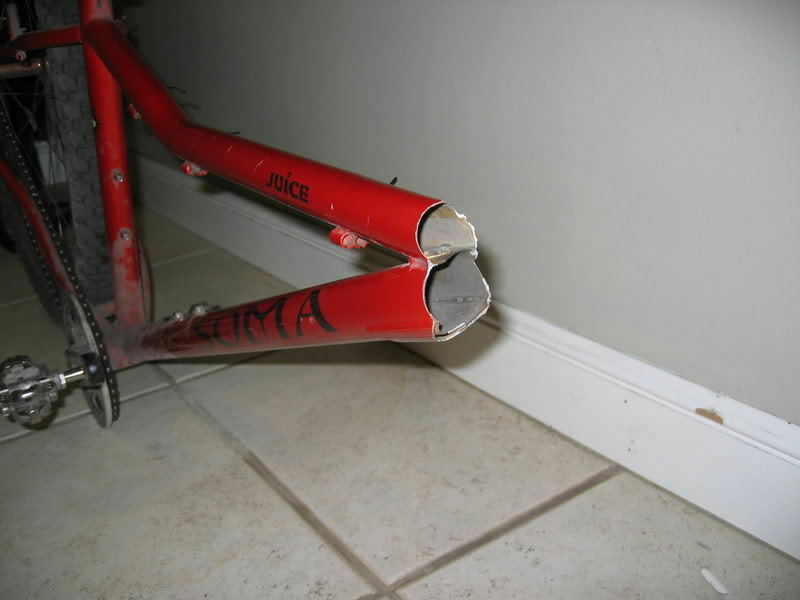 Which frame does the OP have: bent top tube (broken frame), or bent down tube (BigBubba). BigBubba's frame design seems a lot more rational and like it would be stiffer than the broken design. Ok, I took a look at pictures when I googled Soma Juice. I found yet another design. This is the bent top-tube design (like the one that broke) BUT IT HAS GUSSETS! I wonder if the bent top tube was found early on to be weak, and they added gussets to strengthen it. I like the design on Bubba's bike better, but still: if the bike is flexy to the point you're noticing it, is it the bike for you? Last edited by WizardOfBoz; 03-19-19 at 12:09 PM. What I was talking about: Kind of a weird design as the bent top tube decreases the angle it meets the head tube at, while the down tube meets the head at an even lower angle. The lower angles increase the stress, apparently enough to require the gusset. It's like "Let's bend the tubes down to make the bike look cool, even though it makes the frame weaker!". Then "Oops, those joints are breaking so let's add a bit of weight with gussets!". And last "Maybe we should bend the tubes in the other direction to get the cool look with lower weight". The current (or at least latest) versions have the straight top and bent down tube. This last design seems to me to be better guided by engineering and performance, rather than aesthetics. Last edited by WizardOfBoz; 03-19-19 at 12:19 PM. Top tube is bent to add stand over clearance. Down tube is bent to add fork crown clearance. This. The bent top tube design is often marketed as a women's version - kind of a MTB variant of a step-through frame. This is very common in lightweight-ish steel frames. As is frame failure. There is a longstanding myth that all steel bikes are better for heavier riders than all aluminum bikes but this does not agree with my experience. I gave up on steel frames as I prefer lighter weight bikes, and while this is possible with nice steel frames, they don't agree with my body size - too much flex and several frame failures are my evidence. I have had much better luck with aluminum. Makes sense, although the stand-over clearance and the fork-crown clearance in all of the models seems adequate enough to not need this, and the frame that broke had a straight down tube. In the second pic, above, the gussets make sense for the more extreme angle of the head/down tube joint and to strengthen the joint having such a close spacing of head and down tube. This gives the weaker design adequate strength (at least, we hope so). What I can't grok is the bent top tube/straight down tube design, with the two tubes touching, without a gusset. That seems to me to be something designed for disaster. 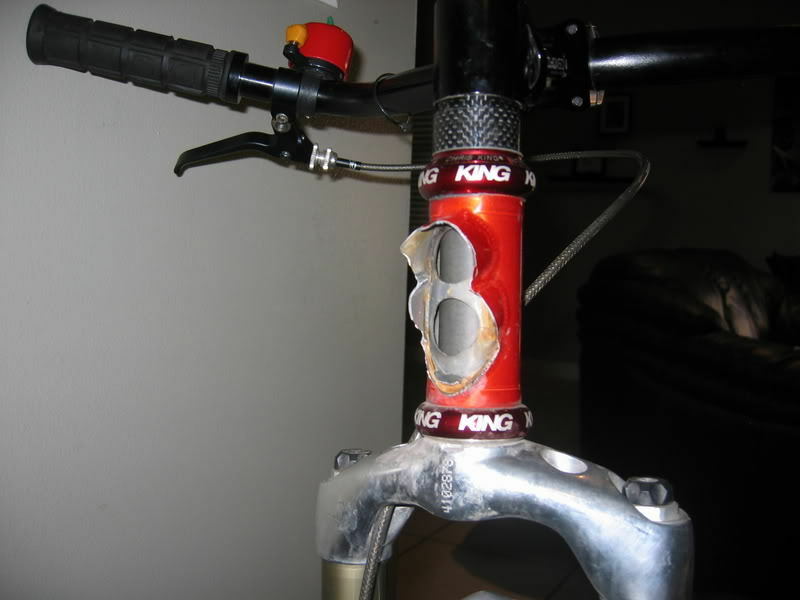 The two tubes cutting into each other limit the weld length of each tube to the head tube. But that ain't the OPs bike. I repeat my 2 cents (the bill is up to 4 cents now!). If you're a big guy, and the bike design of the Juice is known to be "flexy", and you don't like the flex, find a different, stiffer-framed bike. Given that I'm a big guy too, I'm interested: what might be stiffer frames in the same design/cost/quality/feature/degree of coolness range? I think one might go to aluminum, as suggested above, correct? Yes. Maybe. Sometimes. There are very stiff and burly aluminum frames and there are some aluminum frames that are extremely lighweight and more flexy. In general, an aluminum frame will be stiffer than a steel frame, but not always. It depends on the design and construction as much as the material. 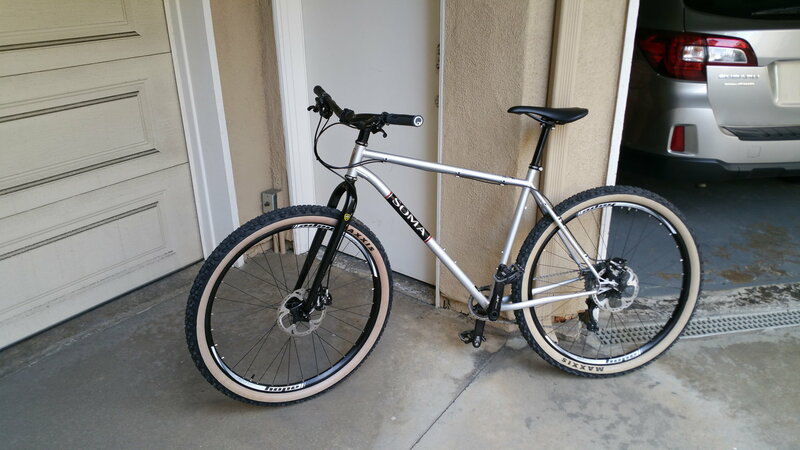 Although for a few years, Kona had a line of bikes called Hoss - they were heavy-rider and hard use specific mountain bikes. And they were aluminum. If I were getting a new bike today, though, I would definitely consider bikes from Surly - they are steel, but (unless I am misinformed) they are made more heavily and wll have less flex than a lighter steel bikes, but with a weight penalty of a couple pounds. @WizardOfBoz - that is an old frame design from Soma. The frame the OP and I have is more of a traditional Diamond shape. @ClydeClydeson - I have seen tons of every material broken. A sweeping statement about any material is ultimately unfair to yourself. With some homework, you can find whatever you are looking for in most materials. Steel can be stiff or flexy, as can carbon & titanium. Aluminum is a bit different, but you can find stiff and less stiff. The amounts of which they are stiff or flexy is a rider preference. In the case of the Soma, the flex is to the point of "loss of confidence" in the bike. - as for your long standing Myth, I have never heard that and I worked in a bike shop. In fact, I have heard the exact opposite. Lighter riders can benefit from the flex of steel more since they won't stress it as much as heavier riders. @Wilfred Laurier - I have a Vassago, Stanton, Salsa, & Surly steel frames in my bike room. All four are significantly stiffer/more confidence inspiring than the Soma. I had previously owned Soma 26" MTBs and loved them. The Juice never lived up to the 26" sibling. I agree. Spent about 6 summers working in a bike shop as a lad myself. Not the same depth of experience as when you're doing it as a career, but one could learn some. Later, I got engineering schooling. So I is en injuneer. And I've read "bicycling science". One of the interesting developments over the years has been the use of hydroforming for the tubes. They aren't just tubular and butted anymore! This hydroforming does thin out tubes (its' intended to!). Also, mfrs use thinner tubes of higher diameter. No problem with that: Schwinn experimented with that and got some good frames long ago (the 80s or 90s I think). But it seems that some mfrs probably don't do due diligence in calculating the effects of welding such thin tubes or learning how to properly weld them. Thin tubes heat very fast, and improper welding results in higher temps and a larger Heat Affected ZonE (HAZE) which can weaken heat treated steel. And then mfrs try to do stuff like the merged tube conflagration seen in the pics of the red (broken) Juice above. Taken from a theory standpoint (cutting some of each tube away weakens the tube and lowers the length of the weld to the head tube) or from a practical standpoint (it broke), that's just a wrong design, IMHO. If you read the book Bicycling Science, the authors go through an example (using straight tubes) in which they show that if you design a bike for the same tensile (acute breaking) strength, your aluminum bike would be somewhat lighter. If you take fatigue into account, aluminum's lower fatigue point requires a thicker frame and you have almost no weight advantage (1% difference, IIRC). But the resulting aluminum frame is MUCH stiffer. On the other hand, aluminum is much more easily hydroformed into odd shapes. This allows designers to shift metal to where it does the most good. Provided that they know how to weld thin-section aluminum! Last edited by WizardOfBoz; 03-26-19 at 08:40 PM.